For more information on Restoration, call 402-944-3100 ext. 231. 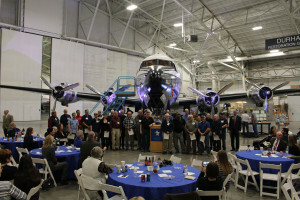 Click here to learn more about the EC-135 "Looking Glass" restoration! Is staffed by a full-time manager, a full-time employee, and one part-time employee. The rest of the restoration crew consists of a volunteers. The Museum currently has approximately 30 active volunteers in the restoration department. In a normal month, volunteer time donated to the restoration effort will total from 600 to 1,000 hours. The annual total of volunteer hours in restoration is around 8,000. The complete restoration of an aircraft at the Museum takes, on average, two years and approximately 10,000 man-hours of labor. Usually, only one aircraft is worked on at a time, due to space in the restoration hangar, as well as the quantity of volunteers. The Museum's restoration process focuses on restoring the aircraft for static display purposes only, due to the quantity of aircraft to restore, finances (it would take more than ten times the funding to restore an aircraft to flight worthy condition), and practicality (the Museum does not currently have a runway). The Museum restoration department strives to return dignity to the aircraft by structurally preserving and restoring to original condition. The restoration process begins with the removal of up to eight coats of paint, from the original USAF paint to the several coats of Sears Weatherbeater that has often been applied with brushes and rollers. The majority of the paint removal is done through a process called soda blasting, the shooting of baking soda at a high speed and pressure. On the T-29, for example, 5,000 pounds of baking soda were used. In places where the paint must be removed mechanically, the volunteers must sand by hand, or use small quantities of chemical stripper. After the paint is removed, the aircraft is washed and assessed for structural soundness. The aircraft is then deconstructed, with all flight control surfaces removed to be restored separately. The control surfaces usually need to be re-covered with fabric or aluminum skins. The controls are restored and painted, and set aside for installation at a later time. The next two steps are completed simultaneously, as they require the most number of volunteers and time. One crew is working inside the aircraft, one on the exterior. The crew working inside the aircraft will remove any equipment and repair or restore them in the shop. Any broken windows, floor panels, or structural pieces are replaced or repaired. Meanwhile, the exterior crew removes inspection and access panels to reveal the inside structure of the aircraft. Frequently, large quantities of bird nests and other debris are found within the structure. After removal, areas of corrosion (caused by bird droppings, which are highly corrosive to aluminum) or damage are replaced or repaired. The landing gears and gear wells are manually stripped of paint, doors are removed and repaired, and other exterior equipment is removed and restored separately. The aircraft is ready for paint once the interior and exterior structure has been repaired or replaced. It is cleaned, and the sections of the aircraft are masked off to allow for each layer of color to be painted. The detail of the aircraft is painted according to Air Force technical orders, photographs, and other documentation. Insignia, USAF markings, stars and bars, and other large markings are laid out by hand, masked, and painted. 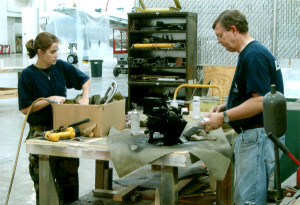 After the aircraft is de-masked, all of the removed and restored pieces are reassembled and installed on the aircraft. The aircraft is then ready to join the Museums's permanent collection in one of the Museum's hangars. While the majority of the restoration volunteers have no previous experience working with aircraft restoration, the each bring skills to help bring the aircraft from disrepair to original condition. Many of the volunteers are retired military or air force. Others bring ability in areas helpful to the restoration process, such as welding. While the current group of volunteers have been at the Museum an average of eight years, the restoration department welcomes anyone who is interested to apply to the restoration volunteer program. Many of the current volunteers were recruited during restoration open houses or member events.